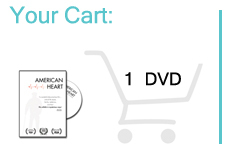 Thanks for your interest in the American Heart DVD. You may purchase the DVD here using a credit card or a PayPal account. For detailed explanations of "Usage Type," see below. Purchasing additional DVDs now will entitle you to quantity discounts. For deliveries in the United﻿﻿ States, shipping c﻿﻿osts are included. For deliveries outside of the U.S., please contact us. American Heart is a film for everyone, whether you are a dedicated fan of documentaries or a casual viewer whose curiosity was simply sparked by the stories in the film. We have also discovered many professionals and educators find the film useful in certain group settings. For this reason, there are multiple "Usages" for a DVD purchase. CONTENT WARNING: This film is NOT RATED, which means it has not be reviewed by motion picture or television ratings organizations. The film does contain real-life scenes of medical procedures which may been disturbing to some individuals. If you have any trouble purchasing a DVD, or you would like to pay by check, please contact us here.